Nothing stokes a hunger like “festive dipping sauce”! Surely we can all agree on a good Thanksgiving dinner – complete with juicy turkey, stuffing and all the trimmings. But what if that dinner was served in the form of a wrap? Would that be just as agreeable? 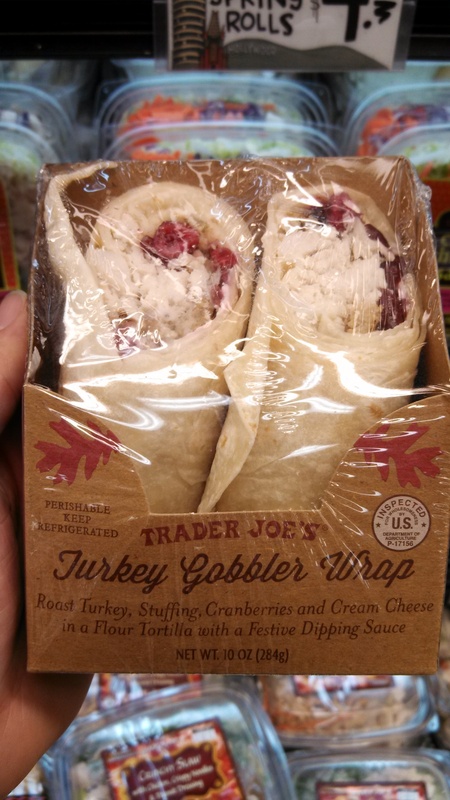 Trader Joe’s is certainly hoping so, with their sandwich, the Turkey Gobbler Wrap. Trader Joe’s Turkey Gobbler Wrap is not the first sandwich to try and cram an entire Thanksgiving feast into a sandwich, not by a long shot. This is America after all, if there were only two thing we like they’d be commemorating our nations founding and compressing whole meals into fast-snacking cylinders. What Trader Joe’s does different from these other sandwiches, however, is loose the bread. I’ll save you some time and tell you right now: that was a misstep, but let’s take a look at what’s actually inside this wrap before passing sweeping judgement. Turkey, as you may expect, makes up the bulk of the filling, along with a combination of stuffing, real cranberries and, surprising to me, cream cheese. This mish-mash works together okay – satisfactory, if not tasty. But who does turkey all that well in a pre-packaged sandwich, really? Who picks up a turkey sandwich, even from Trader Joe’s, and goes, “Oh boy – this is going to be some amazing turkey!” No, you know it’s going to be dry, the only question is how dry. This turkey? Only a little dry. That practically deserves praise. The stuffing is equally satisfactory, only the cranberries really stand out as notable with their big bold flavor. Thanks, no doubt, the the fact that TJ deciced to use big, whole cranberries in the wrap. On two slices of bread, this would be a good sandwich. Wrapped in a whole wehat tortilla on the other hand, it tastes a little off. There’s a certain taste and texture to a cold tortilla that goes wonderfully with some foods,v but just does not favors for most others. A Thanksgiving meal is just one of these that doesn’t go very well with the smooth, chewy, gluey walls of a big, floppy tortilla. There’s another interesting facet to the Turkey Gobbler Wrap – in fact it was the reason I was drawn to it in the first place. Along with all the fixin’s in the wrap itself also comes a serving of “Festive Dipping Sauce”. That phrase is blazing brand new avenues of nebulous terminology. “Festive dipping sauce” is one of those descriptors so vauge and pointedly undefined as to be actually frightening. It’s the kind of name that’s a mask, hiding the real nature of the food you’re about to eat behind a meaningless collection of words. It’s what you do when you realize the chicken you’re serving isn’t actually an identifiable part of the bird so much as it is a slurry of heavily processed ventrical matter, so you just call them “chicken nuggets”. Opening up the little tub, you will discover that it’s an opaque tan liquid which, on taste, strongly resemles a milky gravy. It’s not bad tasting – it might acutally be the tastiest part of the sandwich and it’s certainly a tasty way to combat the dryness of the turkey – but it’s important to remember that it’s not actually gravy. If it was gravy, you can bet they would call it gravy, in the same way that if you could get away with putting “STEAK” on the cans of meat you sell you would. That’s why the FDA has regulations for these things and you’re forced to put “Mechanically Separated Pork” on the label instead. The “sauce” as it turns out, is a mixture of turkey broth, milk cream, sherry wine and roux (a flour/fat mixture), and while lip-smackingly good also remains strangely uncongealed even coming straight out of the fridge. Apart from the tortilla, Trader Joe’s does a good job replicating the Thankgiving dinner – right down to the calorie count. You’ll notice the nutritional information below is only for ½ of a wrap – which means you’re getting 98 grams of carbs and 20 grams of fat along with your 800 calories. That’s an audacious wrap, people. 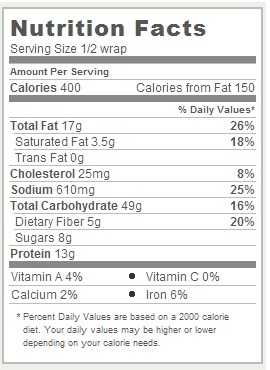 The only aprt of the wrap that didn’t really stand out to me, the cream cheese filling, is the party responsible for much fo the fat and calories. It seems that Trader Joe’s could have subsittued this out for something lighter. As it stands, you’ll want ot substitute out the wrap for a healtheir meal if you’re concerned about your waistline. Would I Recommend It: Not really, unless you’re jonesin’ for Thanksgiving. Would I Buy It Again: I’d go for the equivalent 1.5 Big Macs instead. Final Synopsis: Not bad, but not nearly good enough to justify 800 calories.